Central trade unions are likely to call a one-day nationwide strike on September 2, as a protest at the Union government’s “unilateral” push on labour law changes and non-fulfilment of their demands. The Prime Minister’s Office (PMO) has constituted a five-member committee to address their 10-point charter of demands. It has finance minister Arun Jaitley, minister of state in the PMO, Jitendra Singh, petroleum minister Dharmendra Pradhan, power minister Piyush Goyal and labour minister Bandaru Dattatreya. The formal announcement on a strike will be made on Tuesday, at a national convention of workers in this city. “All 11 central TUs met and decided we will announce a one-day national strike on September 2. However, if the government assures us they will not rush into the labour law reforms until there is unanimous agreeement between us and the government, we will postpone the strike,” said a central TU head, on condition of anonymity. The government denies that an unilateral decision is being taken on amendments to labour laws. “Our ministry does tripartite consultation before proceeding for any amendment. Tripartite meetings have been held for proposed legislation with regard to the small factories Bill, labour code on wages and industrial relations,” stated Dattatreya. The Union labour ministry on Monday released a status report on the TUs' 10-point charter. It said four or five had been fulfilled already. For the rest, it was up to the state governments. “I have done my duty. If the unions are interested in solving the problem, it is up to them. The ball is in their court. We are working in the interest of workers. It is the responsibility of state governments to implement many of their demands. My job is to build consensus and dialogue,” said Dattatreya. He said he'd met Prime Minister Narendra Modi on Friday last week to apprise him of the situation and it was on the latter's advice that an inter-ministerial committee was formed. 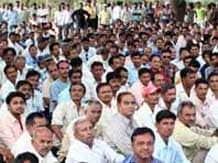 The unions' demands include providing universal social security to workers, firm action against price rise, employment generation, strict enforcement of all labour laws, and stoppage of disinvesment in central or state public sector units. The government's recently proposed bill on industrial relations has also been strongly opposed by the unions. Some of the proposals include easing the rule for retrenchment of workers and tightening of norms for forming trade unions.